Dr Malaak is a bright, hard-working professional dentist who gained a BDS in dentistry in 2003. She continues to further her knowledge by attending many CPD-related courses and successfully completed the Overseas Registration Exam (ORE) in 2013. Dr Malaak Al-Rawi has successfully completed Osseointegrated certificate course in Implant dentistry in 2013. She has a great interest in dental implant treatment and bringing back patients smiles to their full potential. Dr Malaak also completed a certificate in orthodontics providing the most up to date Ortho care in invisalign techniques. She is motivated and positive, driven by a genuine care for her patients. She takes pride in achieving the highest standards possible in every task. Dr Malaak is highly ambitious and is continuously developing her skills in dentistry. George qualified as a dental surgeon from Aristotle University of Thessaloniki (Greece) in 2003. George is a perfectionist and takes extreme pride in his work, customer care and ethics. A beautiful smile can transform one’s life and this is a goal well achieved by him and his team, using the latest and most advanced options in materials, restorative, cosmetic and orthodontic techniques. His relaxed and laid back manner will help you treat your visit to the dentist as casually as possible and even make it a pleasant one. With extensive postgraduate studies in Preventive, Restorative and Cosmetic Dentistry at the Eastman Dental Institute of London and also in materials and orthodontic techniques like Inman Aligner and Invisalign, he is here to listen carefully to you concerns and needs and provide you with the best option for you. Dr George is an award winning dentist. In 2007 he won the Best Dental Team in the South East of England Award by Dentistry Magazine and again in 2008 he was shortlisted for Best Young Dentist in the South East by Dentistry Magazine. Dr Costa Boamah graduated from King’s College London Dental Institute in 2011 with a distinction in clinical Finals. Following a year of vocational training in general dental practice, he then spent two years working in the Oral & Maxillofacial departments of two leading London teaching hospitals. There he was able to enhance his surgical skills as well as spend some time working in the restorative dental departments. In this time he also passed his membership examinations to the Royal College of Surgeons of England and Edinburgh. He then went on to work in general dental practice. Dr Costa Boamah enjoys all aspects of general dentistry and ensures he provides the highest level of care to all his patients. by regularly attending many post-graduate courses. In his spare time, Dr Costa Boamah enjoys swimming and running marathons for various charities. Dr Fawaz Issam has recently joined our team as a Cosmetic Practitioner. Fawaz is a Plastic Surgical Registrar who graduated from the University of Sheffield with a Distinction. He completed his core surgical training within the Kent Surrey Sussex deanery whilst honing his skill and obtained the surgical membership exams (MRCS) and a masters (MSC) in Surgical Sciences. Fawaz has published numerous articles within the field of Plastic surgery (https://www.researchgate.net/profile/Fawaz_Al-Hassani) as well as presented nationally and internationally at the BSSH FESSH and BAPRAS meetings. On side of his surgical achievements, Fawaz strongly believes that the non-surgical aesthetic field is quickly evolving and has a role for patients’ needs. He endeavours to provide the best care for his patients along his team at the Wimbledon Dental & Implant Centre. He is friendly, caring and above all passionate about delivering the best care. Sophie has been a dental nurse for 22 years, qualifying in May 2005 at St Mary’s Hospital, London. During these years she has worked in various dental practices gaining experience in dental sedation RA and IV, oral surgery, dental implants and was a specialist dental nurse for 6 years working with maxillo facial surgeon’s periodontists and endodontists. Sophie joined the practice in 2017, and was given the role of receptionist and practice manageress. 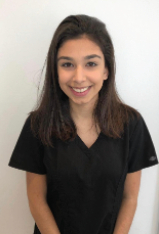 With her vast knowledge of dentistry and pleasant and friendly nature, Sophie provides the practice with excellent patient care and is happy to answer any questions regarding treatment available within our practice. Outside of work Sophie is a keen adrenaline sports person and has done many things for charity including Sky Diving, abseiling down Twickenham stadium and bungee jumping, she would like to get her A licence for solo sky diving to go onto base jumping. Rose has been a dental nurse here at the practice for the past 5 years. She completed her NVQ in dental nursing in December 2014, and is an asset to the practice. Rose is extremely passionate about providing a high standard of clinical care whilst making our patients feel comfortable and relaxed. She likes to build friendships with our patients and hopes they trust her as their nurse. Rose is very capable at decision making and will always go the extra mile to help out our patients. Rose is keen on fitness and healthy living and will help promote this to patients and is happy to give advice. If you would like further information about the dental treatments we offer, or you would like to arrange an appointment, please call our friendly reception team on 020 8542 3554.